Since 2006, the GDP of Italy has declined by 6.23%. However, there is an Italian excellence recognised all over the world that has bucked the trend, experiencing a dramatic increase of 21.80% in exports: olive oil. It is thought that olive cultivation was brought to southern Italy by Greeks around the VIII–VII century BC, and was widely adopted by the Romans of the time. In those days, the main use of olive oil was primarily used to light lamps, given the low amount of water inside the oil. Romans then began adopting the use of olive oil not only for lamps but also in cooking, bathing, medication and rituals. 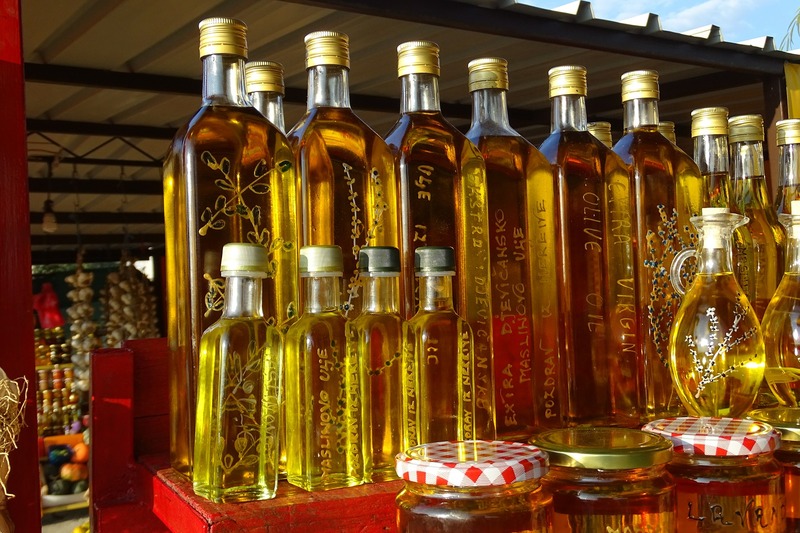 The wide exposure to olive oil in Roman lifestyle led to the development of better extraction processes and became a source of income to some. Recognising the importance of olive oil, Roman emperors insisted that olive oil be imported from Spain to Rome to meet the needs of the empire, even though “Romans believed that the finest olive oil was the one produced in central Italy”, as reported by Dalby in “Food in the Ancient World A to Z”. Since ancient times, then, olive oil has been recognised as an extremely valuable commodity. From 1990/91 to 2015/2016, the world consumption of olive oil increased by 79%. As shown in the picture, the country that experienced the largest increase in consumption over this period was Japan, followed by the United Kingdom, Germany and Russia. There are many explanations for this increase, but most of them relate to the health benefits of the olive oil. It has been proved that olive oil may help in preventing strokes, heart disease, Alzheimer’s disease, type 2 diabetes, treating rheumatoid arthritis and has been found to have anti-cancer properties. Therefore, the more the people understand the benefits of this product the more they are willing to consume it. In 1920, Zefferrino Monini founded one of the leading brands in the olive oil industry, Monini. Over the years, Monini has established a strong marketing campaign in Italy based on two ideologies: education and innovation. Monini are influential in educating more than 1,500 schools in how olive oil is made, and how best to utilise Monini olive oil in cooking and food preparation. Monini are leading sponsors in festivals such as the Spoleto Festival – an international musical, cultural and artistic festival and a social eating platform called ‘Gnammo’. Moreover, like almost any company trying to attract new customers, they are active across social media platforms; Facebook, YouTube and LinkedIn. Once Monini recognised the success of their marketing strategy, the next step was to expand. Monini didn’t wait long. After becoming the leading olive oil brand in Italy, they soon expanded into Europe and America. By 2002, 25% of Monini’s revenue was coming from exports, selling Italy’s most famous olive oil in over 45 countries. To accommodate their international customers, Monini took the decision to localise their website and online marketing. Monini created personalised websites for Poland, USA, France, Switzerland, Ukraine and Australia. The marketing strategy on the Ukrainian and Polish websites is primarily focused on contests, designed to engage customers with the brand, while the marketing strategy on the American website is more focused on the product itself. In fact, the American website is the only one with a dedicated online store – the other websites only have shop locators. On social media, the company uses a content marketing strategy based on recipes that encourage customers to try the entire range of olive oil flavours on offer, and pictures of events in which the company takes part. By translating their content, Monini’s aim is to integrate the great reputation of their Italian olive oil with the food and culture of countries around the world. Engaging customers in their own language has helped strengthened Monini’s international reputation, enhancing its global export potential. Like the Italian olive oil exporters, introducing your product to other countries will allow you to expand your business and your customer base. Garnering international exposure opens a large variety of opportunities which you might not be aware of. 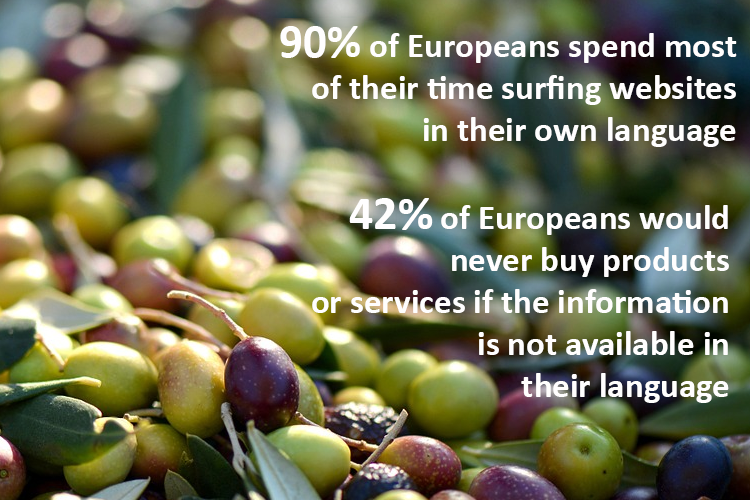 As indicated by the European Commission, 90% of Europeans spend most of their time on websites in their own language when surfing online, and 42% of these surfers would never buy products or services if the information is not available in their mother tongue. Moreover, running a multilingual website will improve your SEO on a global scale, making it easy for people to search for and find your products and services. Here at Wolfestone we offer multilingual SEO consultancy services as well as localisation services. We can help you to distribute your message, exactly as you intend it to be heard, in many different languages, across many different countries. Maintaining the communication with your new international clients will be smooth like a fine Italian olive oil! Contact us if you want to find out more about our Italian translation services or any other language.